There are several changes to the normal (and expected) entry for the final race of the FIA GT season on November 18 – the most significant being the late inclusion of the Phoenix Racing Aston Martin DBR9, which has been flown out to the event, and the replacement of Matteo Bobbi by Toni Vilander in the #58 AF Corse Ferrari. “We’re going to Dubai to win,” says Jean-Denis Deletraz. He and Andrea Piccini have some unfinished business, after being knocked out of the Adria event by Fabio Babini in the BMS DBR9. At least that means no ballast for the #5 car. Piccini on pole? In GT2, Matteo Bobbi had thought that he was the GT2 Champion, with Jaime Melo – and he still might be. 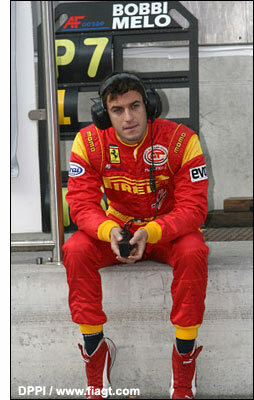 But the Italian has been dropped from the team for the last race, to be replaced by Toni Vilander. “The first rule of racing is that you don’t collide with your team-mate,” commented Mika Salo, of an incident during the Adria race – but one that became irrelevant when the Salo / Aguas AF Corse Ferrari was disqualified for a ride height infringement, thereby handing the title to Bobbi and Melo.. or just Melo if the Brazilian finishes in the points at Dubai. The AF Corse Ferraris have both crossed the line in the top six in every race so far this year…. which hasn’t been a harmonious one between the 58 and 59 squads. Other changes include Larbre entering the ‘electronically controlled’ Ferrari 550, Vitaphone adding Eric van de Poele and Vincent Vosse to their squads (as at Spa), Babini being joined by Malucelli in #23, no Lamborghini, Mike Rockenfeller joining Emmanuel Collard in the #75 Porsche (Luca Riccitelli is about to become a father for the second time) and the expected return to the series of a pair of Spykers.